Going Greek is an experience of a lifetime that we encourage every woman to be a part of. In Zeta, your daughter will balance academics, sisterhood, and leadership through our award winning programs. While being part of a Greek organization may seem time consuming, most of our women find time to be involved with other organizations around campus! When we aren't studying together in our chapter room, participating in fun sisterhoods, or hanging out together, our women give back to our community any way they can. Volunteer programs are a large part of who we are at Saint Louis University. We believe that through helping others, we learn more about ourselves and can better grow into outstanding women. The women of Kappa Omega chapter appreciate and understand how important our parents and guardians are to not only our growth in ZTA, but also our growth in additional aspects of our lives such as school, work, faith, and friendship. Plenty of things wouldn’t be possible without the love and support we receive from our families. We also realize that parents and other family members may be interested in learning more about Zeta Tau Alpha, or even have questions that they would like to have answered. Please feel free to take a look around our facts and questions. • Mission Statement: "To make a difference in the lives of our members by developing the potential of each individual through innovative programming, which emphasizes leadership development, service to others, academic achievement and continued personal growth for women, with a commitment to friendship and the future based on the sisterhood, values and traditions of the past." • Our purpose: The purpose of Zeta Tau Alpha is the intensifying of friendship, the fostering of a spirit of love, the creating of such sentiments, the performing of such deeds, and the molding of such opinions as will be conducive to the building up of a purer and nobler womanhood in the world." Q: Where does due money go? 1. National Dues include technology, scholarship, per capita, insurance, and housing reserve fund fees. These dues support everything IO does. 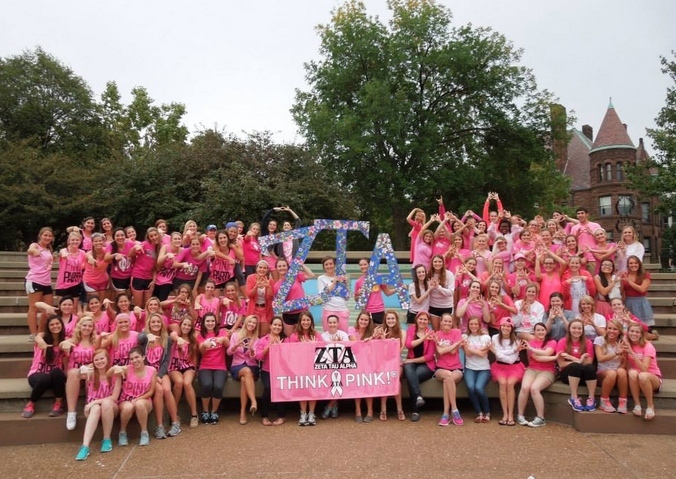 This is what allows ZTA to be a strong and well-known chapter nationally! 2. Chapter Dues include officer budgets, sisterhoods, socials, composites, and 2 t-shirts. Everything except optional merchandise or sisterhoods are included in this budget. 3. New Member Fee: If your daughter is a new member, a $180 new member fee is added, along with the fee for a badge that is required for ceremonies and all chapter badge attire days. These dues are ONLY paid the semester you are a new member. Q: What’s so great about my daughter being a ZTA? A: Zeta Tau Alpha is one of the greatest opportunities a woman could ever take advantage of. We, not only as a group of friends, but as a group of sisters, support and lift one another up to our highest potential. We are strong, unique women with the same set of shared values that enable us to not only respect ourselves, but to respect those around us as if they were a part of our foundation. Q: How can I contribute to the Philanthropy?